The Tinderbox writing and recording sessions had taken a lot of time and effort - almost the whole of 1985 - so the band decided to take another route with their next LP. Thus, they ended up recording 1987's Through The Looking Glass, an album solely consisting of cover versions of pre-existing songs. That's right, a cover album. Now, the thing about cover albums is that they can end up being extremely boring: it's songs you've already heard before, and usually not that radically reworked either. Furthermore, going exclusively for covers can be a rather lazy option too (hey, you don't need to write anything yourself, when you're relying on great songs already made popular). However, Siouxsie and the Banshees were not your average band - when they did covers, they nailed it. They had already recorded and released a bunch of covers, ranging from two Beatles covers, both from the latter's eponymous 1968 album ("Helter Skelter" appeared on their debut LP The Scream and "Dear Prudence" was included in the US version of Hyæna) to additional singles B-sides. They were not a lazy group of musicians either, often revamping the songs beyond recognition, making them distinctively Banshees-y songs in the process. "Helter Skelter" for instance was remade into a full-fledged post-punk stomper whereas the dreamy "Dear Prudence" became a blissful pop gem in the Banshees' hands. So, they had already successfully done some sporadic covers, but how would they fare with a whole 10-track collection of them? Pretty well, truth be told. And to make things more interesting, they didn't only pick big hits, so the assortment of songs is eclectic, too. One of the most notable examples of this is the hypnotic "Trust In Me" (yup, the song sung by the python Kaa in the 1967 Disney film The Jungle Book, of all things!) that receives a thrillingly exotic remake with harp-playing and Budgie's percussion and Siouxsie purring sensually and seductively throughout the song. Quite an untraditional use of a Disney song, wouldn't you say! "Hall of Mirrors", the eerie Kraftwerk track, is another fine example: set to a straight-forward post-punk beat and instrumentals featuring pianos, guitars and again, harps (and the occasional synth as a nod to its origins), it can barely be recognised as the same song. "I've heard it, that's good. She sings it well and she threw a little note in when she sings it that I wish I had thought of, this kind of improved it. And I thought that Budgie plays real good on it and the horn thing is good." Apparently, they let him listen to the song beforehand and took him to the ballet as a "Banshee bribe" before releasing it. Nice. Their cover of "The Passenger" is as a matter of fact one of the more faithful versions on the record, not really changing that much while re-recording it (compared to many of the other songs) but it works well nevertheless and is approved by Iggy Pop himself too. 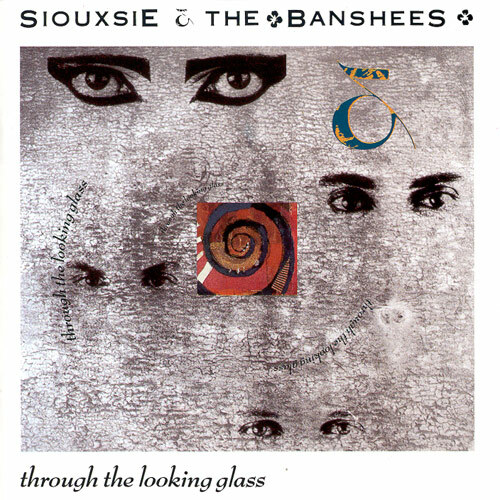 Also, Siouxsie's voice is an essential and inseparable instrument itself in the Banshee sound so whatever she does sing, she tends to succeed in making it completely hers anyway. "This Town Ain't Big Enough for Both of Us", the opening track, is another example of a less radically reworked number. On most of the tunes the band do get very creative with their "Bansheefying". "This Wheel's On Fire", whose Julie Driscoll version later became the theme song for the TV series Absolutely Fabulous, profits greatly from its string arrangements the way "The Passenger" did with its respective brass section. And then there's "You're Lost Little Girl", a splendid Doors cover, which breathes life into the track that the original version was perhaps lacking, even featuring an eccentric funhouse-styled solo, slightly reminiscent of the more disturbing side of amusement parks (a musical theme further played with on their following LP Peepshow). Combined with the album title, the song also brings to mind the bizarre adventures of Alice in Wonderland, something which their surreal 1984 Play At Home TV special was also built upon. One of the highlights of Through The Looking Glass is undoubtedly the dreamy Roxy Music cover "Sea Breezes". The slowly unfolding piece is a beautifully serene remake of the originally seven-minute track the was a bit of a mess to be honest, and builds up to a soaring climax. To end the album comes an unexpected cover of Television's "Little Johnny Jewel", selected in order to bring "an element of surprise on the record", as put by Severin (NME (21/03/87). The album, while sometimes shrugged off due to its lack of original material, is ultimately a strong one, with a richer soundscape than the Banshees had had in years - strings, brass, and harps galore! Instrumentally speaking it is their most diverse one since 1982's psychedelic A Kiss In The Dreamhouse. The album cements the group's status as an incredible band even when covering other musicians' material, truly leaving their own unique Banshee mark on the material that they worked with - they sure had their way with cover versions. The remakes of the songs, ranging from loyal to barely recognisable, are exceptional and had they been original songs, would probably be applauded as one of the strongest Banshees album. The only one I'm not overly keen on is "Strange Fruit", a Billie Holiday protest song and guitarist Carruthers' pick, whose New Orleans styled funeral march just doesn't do it for me. The very same track was later, in 2007, praised by NME who selected it on a compilation album of cover versions of world-changing songs. Go figure. Anyway, Through The Looking Glass is a mature album consisting of skillfully Bansheefied rearrangements of older songs. It also allowed the Banshees to more freely experiment outside their trademark gloominess that was often present on their albums - here the band sounds unusually lighthearted and upbeat. A cover album can as an idea feel a bit suspicious but this one is completely justified by its superb quality. It works as a stand-alone album too but for the ultimate experience, check out the original versions as well: only then can you fully appreciate the wonders that they did with the songs. Try at least: Ugh, so many brilliant tunes to choose from. "The Passenger", "This Wheel's On Fire", "Trust In Me", "Sea Breezes"
So, there's a new Dragonette collaboration out. Attention, all lovers of Nordic pop music! You can now follow Popheaval on Twitter, too!